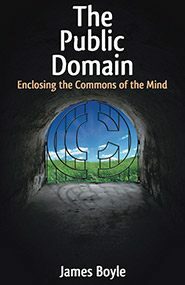 ‘The Public Domain’ – Enclosing the Commons of the Mind, by James Boyle is an attempt to tell the story of the battles of intellectual property law, what happens to the information on the Internet, and what should be done. It all started when Boyle was asked by his 8 year old son why one couldn’t click through and read the 70 year old book on the online catalogue of the Library of Congress. For Boyle’s son, the Internet is an open source of information, free for all, no restrictions. That is what the young users of the Internet, (the ones who don’t remember life without Internet) today almost believe in, “just Google it”, or “look it up on Wikipedia“. Unfortunately, it is quite the opposite and issues like copyright, intended to be the “servant of creativity, a means of promoting access to information”, is becoming an obstacle to both. Boyle’s main cause is the importance of intellectual property on the Internet, why it is the legal form of the information age, and stresses that every citizen should know about it. Secondly he tries to persuade the reader that the (US) intellectual property is heading in the wrong direction. We need a movement – akin to the environmental movement – to preserve the public domain. a politics that enables us first to see and then to preserve the public domain, to understand its contributions to our art, our technology, and our culture. Each chapter deals neatly with a topic, from peer-to-peer sharing (Napster) synthetic biology and music sampling, digital locks and the hackers who break them (DeCSS), Jefferson and Macaulay, and the fight over video recorders (Sony). Boyle’s writing style is very down to earth, almost like a narrative, like a friend who encourages you to listen, explaining with many examples and allegories, and making parallels with very easy to understand language. In his preface, he almost apologises for this, knowing that he sacrifices depth for being ‘readable’. I believe he has done a good thing here. If all the complicated issues were written and directed only at professional academics, the purpose of his ‘movement’ would be over before it started. Perhaps being ‘readable’ is even better, for the people of the Internet future, New Media students and people who would want to understand these issues if they were presented to a layman. For example, on the very complicated topic of Digital millennium Copyright Act (DMCA) he explains this through Farmers & Barbed Wire. One criticism however is the brevity of what ‘must’ be done in the future. Boyle describes firmly his proposal in Chapter 4 – The Internet Threat, and in Chapter 8 – A Creative Commons, but lacks clarity and strength as a whole. He is clear in what he believes we need and what current policies do not work which gives good background and demonstrates careful research, but one leaves the book asking “well what can I do?”. In summary, Boyle tries to be fair, to explain the issues and give both sides of the argument. He presents cases and compares judgements, and questions their decisions. At the same time, he also transparently discloses his biases and affiliations. we need to recognise the public domain and to save it. The Public Domain is published by Yale University Press and can be read online.